Sale $79.99 while supplies last. 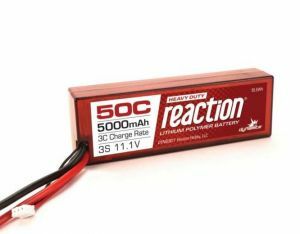 The Heavy Duty Reaction LiPo Battery packs from Dynamite represent awesome quality and value that provide the power and performance for the everyday RC enthusiast. These HD 50C packs were specially designed to provide the needed power applications that require a little higher demand like RC Boats and 1/5 and 1/6-scale vehicles. 3C charge rating for quick, safe recharging.